An affordable, Swiss-powered pilot's watch from the Netherlands. What’s very difficult to do after an initial success is to replicate it. 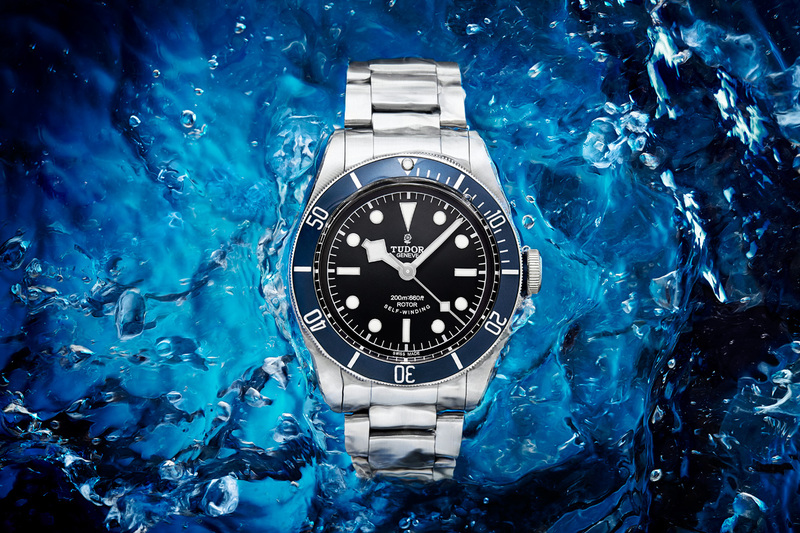 We see it in movies (a sequel is almost never as good as the original) and we often see it in watches. After launching its very original inaugural collection, in 2016, Netherlands-based brand EZA Watches launched a second model in 2017. After the original EZA Watches Sealander, the boys followed with their take on an aviator’s watch, the AirFighter. A blue version was only a matter of time, as their first new collection came in black and blue too. 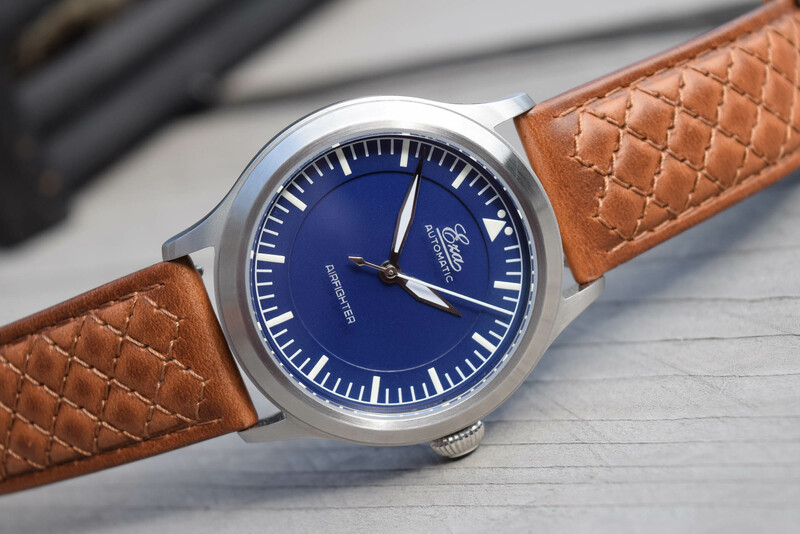 Let’s discover the new EZA Watches AirFighter Blue. 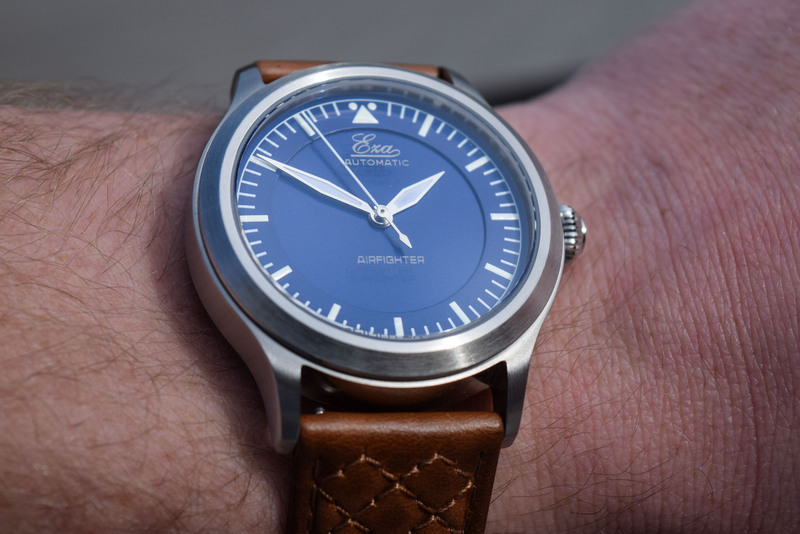 One thing has to be taken into consideration; EZA Watches was originally based in Pforzheim, Germany and was founded almost one hundred years ago. Known for its watch cases at first, the brand was making full mechanical watches by the 1950s, after eventually going bust in the midst of the quartz crisis. The relaunch in 2016 by of a duo of young Dutch entrepreneurs is writing a new chapter in the EZA Watches history. Since the relaunch, the brand has released two collections, the Sealander and the AirFighter. Technically this new blue version is no different from the black AirFighter, which we reviewed in 2017. 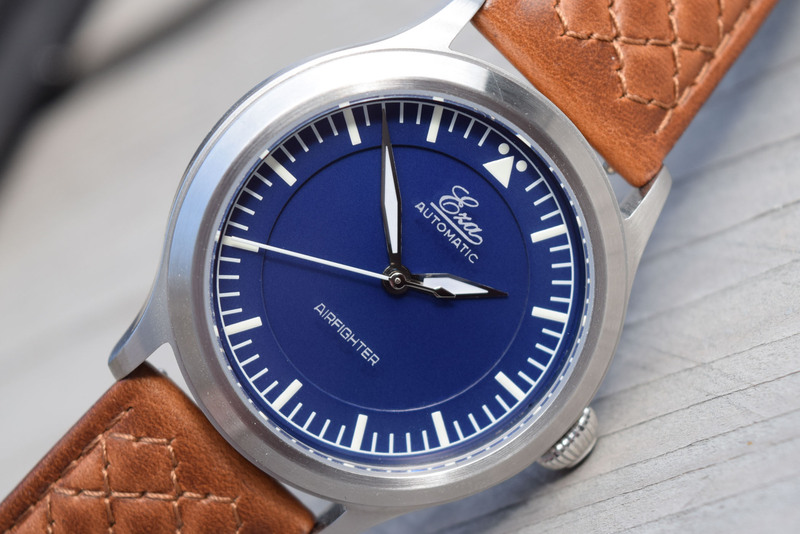 The EZA AirFighter Blue receives a splash of extra colour with the new blue dial. The multi-level sector layout of the dial is still present, along with the quintessential triangle and dots for the pilot’s orientation at 12 o’clock. Sword-shaped hands, metallic instead of blued with luminous material, indicate the hours and minutes, with a slender seconds hand extending to the very edge of the dial. 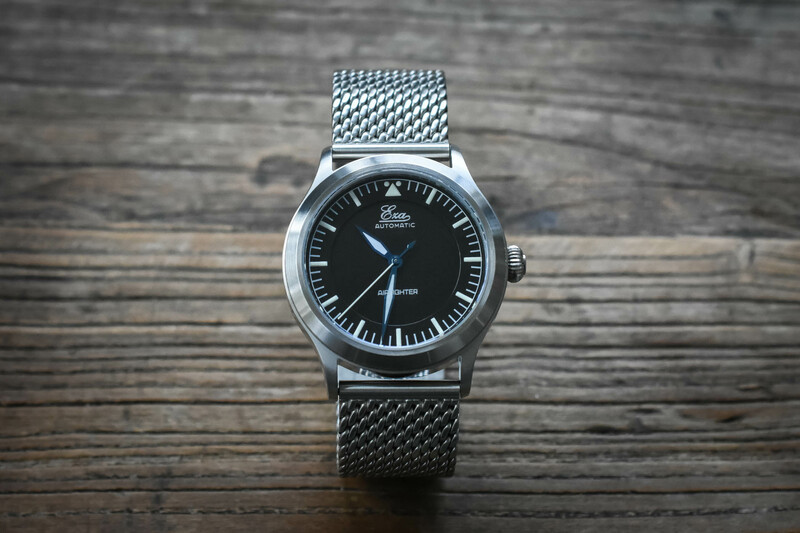 The sturdy 316L stainless steel case measures a reasonable 41mm across, not including the crown. Most wrists will easily fit a watch this size, as 41mm by 13mm in height is nothing overly huge. A mix of brushed surfaces and high gloss finishes, a facetted bezel, and monobloc lugs result in a very pleasant case. A nice onion-shaped crown complements the case. 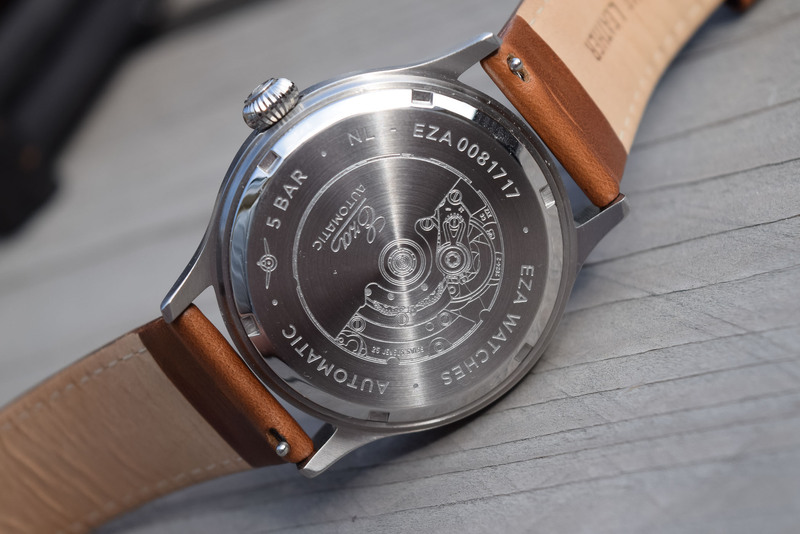 Although the caseback is sealed, an engraving of the automatic movement that powers this watch is a cool touch. The movement inside is still the ETA 2824-2 workhorse, which is adjusted to 6 positions in the EZA workshop. No need to go over all the specs, as this is a very familiar automatic movement, of course. 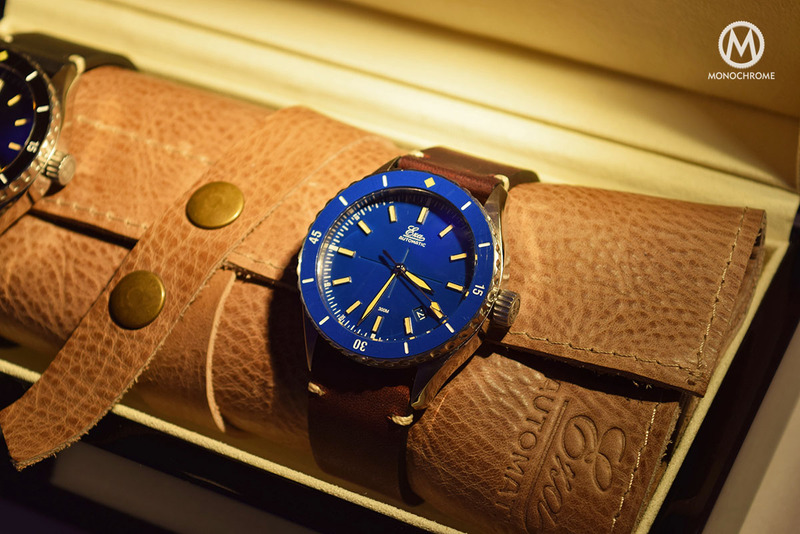 Another nice touch is the logo, engraved on the sapphire crystal, which gives a bit of depth to the blue dial. Light will hit it, and create a shadow – a simple but elegant detail. As with previous EZA watches, a variety of straps are available. 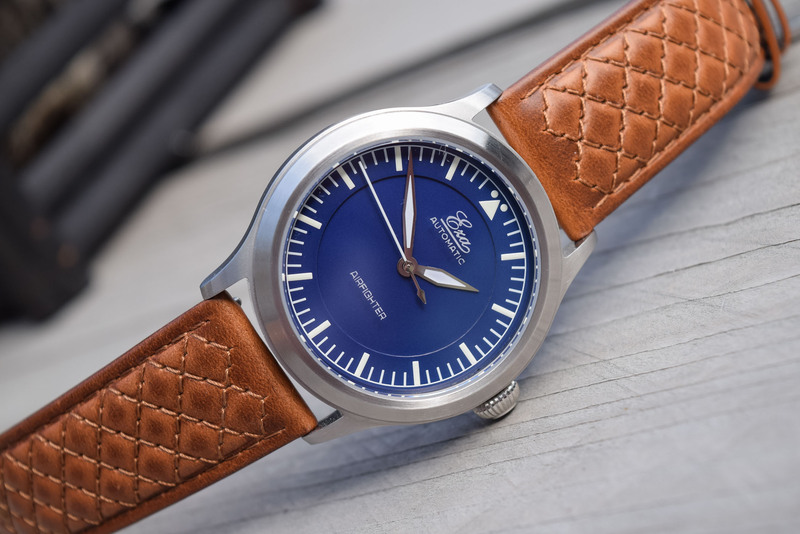 You can opt for a vintage-style leather strap, in Cognac, dark brown or black, but also for a quilted Italian leather strap in any of these three colours. 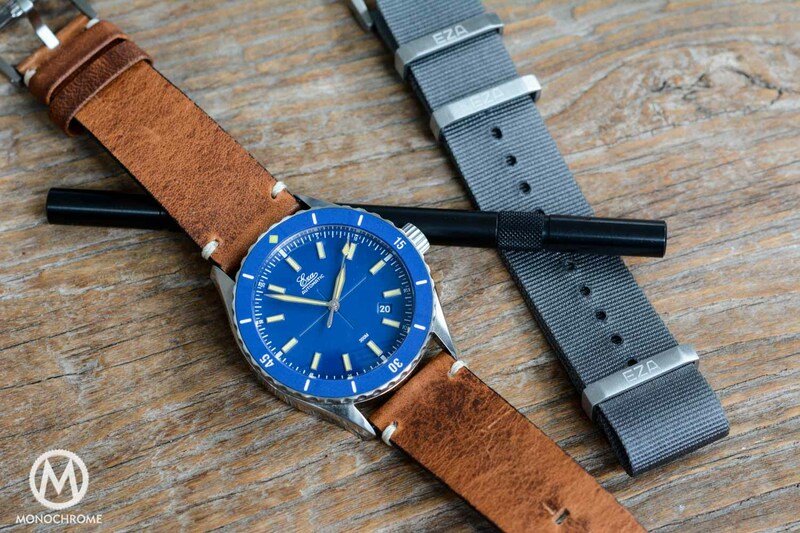 Besides leather, a mesh bracelet is also available and ALL watches come with an additional grey NATO strap. If you want our word for it though, go for the quilted ones! The price for the EZA AirFighter Blue is a very reasonable EUR 725 on leather or EUR 795 on the mesh bracelet. 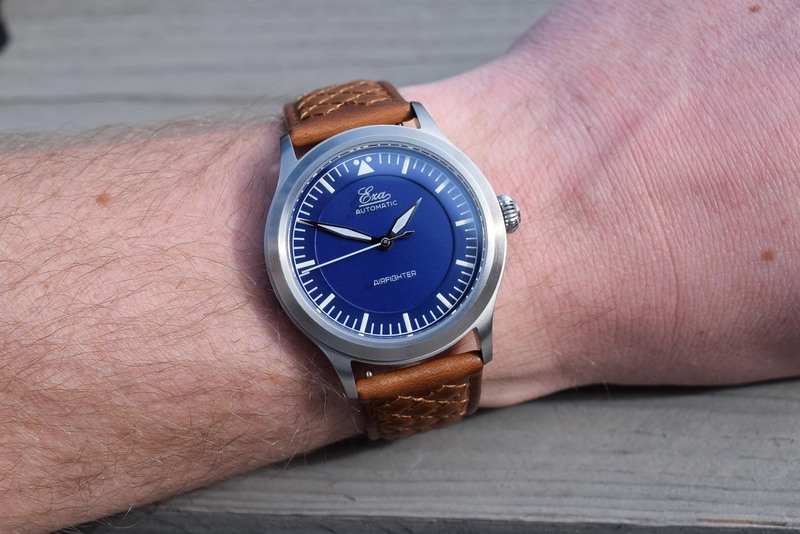 More information on EZA-Watches.com.